Stewart Wingate is a Chartered Engineer and has been Chief Executive of Gatwick Airport since 2009. 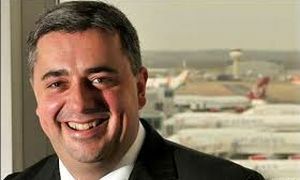 He was Customer Services Director of Glasgow Airport (2004-2005), Chief Executive Officer of Budapest Airport (2005-2007) and prior to the purchase of Gatwick by a group headed by Global Infrastructure Partners, Managing Director of Stansted Airport (2007-2009). He has a Master’s in Business Administration. The runway decision must strike balance between the economy and environment. The national debate over where Britain’s next runway should be built has reached an important point – the airports, business, and the community have given their views – and the Airports Commission will now decide which of the options it believes is best. I believe the choice can be boiled down to the simple proposition: we all want Britain to grow and to prosper but do we chase economic growth at any cost or do we recognise that any economic benefit must be considered alongside the environment and the community? The momentum behind Gatwick’s case is growing because, as this summer’s final decision draws closer, people are increasingly realising that expanding Gatwick is the best answer to these questions. Aviation is changing. Who could have predicted 20 years ago that easyJet would become the country's biggest airline? In 2003 the Government's aviation White Paper hardly made mention of Dubai but it is now the largest airport in the world – demand driven by its location between continents. None of us has a crystal ball so we must ensure London's airports have the flexibility to adapt to whatever the future might hold. As the airport serving the most destinations and the only one able to cater for all airline models, expanding Gatwick can future-proof London's airport system, creating a resilient network of airports that gives the country the growth and connectivity we need. And it surely makes no sense to turn the clock back and reinstate a monopoly when passengers are feeling the benefits of competition. Airport liberalisation has been one of the most successful market reforms of recent years. We are all seeing the benefit with lower fares and higher service standards – expanding Gatwick is the only way for competition to continue to thrive among the UK’s airports. Aircraft are noisy. There is no way of sugar coating this fact. More planes will never mean less noise. They may become quieter but they will obviously never be silent. So the impact of noise on communities is at the heart of this debate. Expansion at Heathrow will newly impact 320,000 additional people – more than the population of Coventry. At Gatwick around 18,000 people will be affected. I am acutely aware this is still a very large number. We believe business in the 21st century has a responsibility to minimise impacts but also to compensate those most affected by them. So we have pledged to pay the Council Tax of this group if Gatwick expands – an industry-leading initiative. Gatwick has also never breached UK or EU air quality guidelines because it is located in a largely rural, sparsely populated area and is not surrounded by some of Europe’s busiest motorways. We also operate one of the cleanest aircraft fleets in Europe. This all means Gatwick would still operate within legal air quality limits with a second runway. There are many things that can change in this debate, but the one thing that can't is the location of each airport. The location of Heathrow brings with it a scale of environmental and political opposition that poses serious questions on whether expansion and the economic benefit it would bring is possible there at all. Both airports are fighting strong campaigns. There is business support for both. But all business can unite around one thing. After years of delay – with Heathrow being considered and then ruled out as too difficult – the UK needs something to happen. Choose Gatwick and we can have spades in the ground by 2020 and the runway operational by 2025. No tunnelling the M25. No £6bn taxpayer subsidy at a tough time for public finances. Simply Britain getting on with it. In short, Gatwick simply does not face the overwhelming environmental and political obstacles that standing in the way of Heathrow. Expanding Gatwick enhances competition in the sector and delivers the economic benefits of increased airport capacity, more simply, quicker and at lower cost to the consumer, without any public subsidy. So when considering a solution that is best for both the economy and the environment – and crucially if we want something to actually happen – the answer must be Gatwick. It is the only viable proposition. I see that Stewart Wingate has not even addressed the issue of an international hub airport. Heathrow is, Gatwick is not, and cannot be. Airlines want Heathrow. Expand there - first. Then Gatwick.